This is our custom-built Specialty power/extension/adapter cord. Construction is top quality Leviton, Union Connector, or Neutrik connectors with Carol Brand 12/3 SJOOW. We have picked these brands over others because they are top quality for years of service. Carol Brand 12/3 SJOOW cable is very flexible, durable, heavy-weight cable. 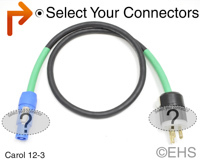 Select the connectors and lengths needed to create an extension cord, power cord, or a power adapter. What it's connecting to or from, for example "Dimmer 1" "Stage Left" etc. Length is the cut wire length, and will be about mid-connector to mid-connector. Photo 1 shows 3' cable with Edison 15A Male and PowerCON A and green shrink label. Photo 2 shows one option for the two ends with Edison 15A Male and PowerCON A and green shrink label.